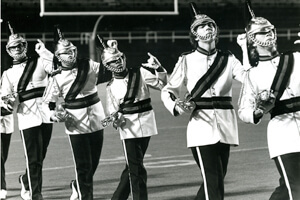 Not to be outdone by their neighbors to the north or west, Midwestern drum corps alumni will reunite on Monday, July 16 in Lebanon, Ill., just prior to the 2012 edition of DCI St. Louis presented by Etymotic Research. Hosted by McKendree University, alumni from a number of corps including the American Woodmen, Bellettes, Black Knights, Blue Devils, Chessmen, Colleens, Corvettes, Crusaders, Egyptionaires, Explorers, Gabrielletes, Golden Hornets, Green Mules, Memorial Lancers, Post Office Cadets, Spirit of St. Louis and St. Agnes will gather for the reception at 5:30 p.m. (CT) in the Hettenhausen Center for the Arts adjacent to the stadium. Any drum corps alumni with any corps affiliation are welcome and invited to attend the free event as well. View a McKendree University campus map. Immediately following the gathering, competition will kick off at 7 p.m. on Leemon Field. Corps scheduled to perform on Monday include: • Music City • Pioneer • Cascades • Crossmen • Troopers • Phantom Regiment • Carolina Crown • The Cavaliers Tickets for DCI St. Louis start at $20. Stadium seating is limited, and it is recommended that you order your tickets in advance. Learn more about the DCI St. Louis event and order your tickets today.